For those of you that have no clue what I am referring to - it will be the tax credit deadline. I'm going to let you all know what you need to be doing before the deadline (31 July 2015). In the past, individuals in receipt of Tax Credits have had to complete their annual declarations by forms and/or spend countless hours on the phone to HMRC trying to get through (0345 300 3900). Once through, HMRC ask you a series of security questions to confirm your ID. You let HMRC know your 'estimated/actual' self employment or 'actual' income figures for the tax year ended 5 April 2015. 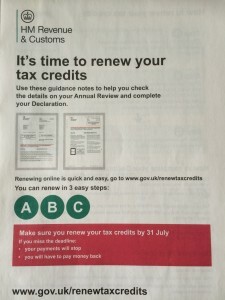 TOPTIP: You have until 31 January 2016 to update Tax Credits of your 'actual' self employed income for 2014/15. Step A: Check that the personal circumstances HMRC based your claim on at the start of your award period are correct. Step B: Check that any changes made to your claim during your award period are correct. These could be changes you've told HMRC about, or changes HMRC have made. If any changes are missing, or you haven't told them about a change, you must inform them straightaway. Step C: Check the income details in your Annual Review before filling in your Declaration. As we all know, money is stopped when changes occur, so let's also hope this new online system means less of a delay with getting the money put back in the bank and also eradicates the potential debts to be repaid to HMRC.